1-1/2″, 1-3/4″, and 2″, plus 6040 (1-1/2″). Flats can also be added to 1-1/2″ & 2″ diameter fittings upon request. Joins easily to standard full round rails:1-1/2″, 1-3/4″, 2″. Red oak, maple, poplar, douglas fir, mahogany, redwood, western red cedar. Other woods are available and quoted upon request. High quality, Manufactured in the USA. Discounts quoted on 200 fittings and over, same diameter, species and shape. Minimum order is 25 parts per diameter, species and shape. Orders less than our current minimums will be accepted subject to a price increase based on quantities. Call for pricing. Parts are finished to 120 grit. Modifications to length are available. Call for pricing. The fittings are ADA & Code Compliant. 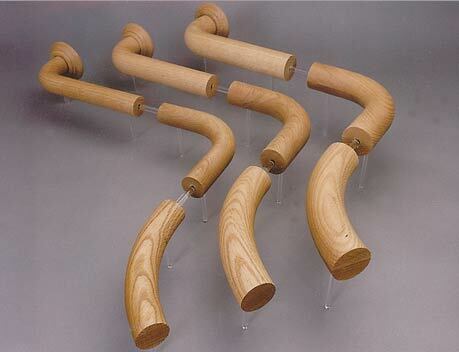 Our fittings are fabricated from high quality solid stock in both hard and soft wood. Beware of low quality imitators whose fittings are made from pieced-together laminated wood. You can also order all your stair hardware from Auer-Jordan. We offer Spring-Bolts, the improved wood rail & newel post fasteners. These revolutionary fasteners make installing rail easier, faster and with totally concealed hardware that requires no plugs or putty. Easy profile alignment reduces profile blend time plus creates a stronger joint.